Chavismo’s animus against Maria Corina Machado, the leading democracy activist who was indicted on trumped-up charges of “conspiracy” today, has reached farcical extremes. Today, attention was focused on whether she would be jailed – she won’t be quite yet. Nonetheless, the torrent of abuse she’s faced these last few years is extraordinary. Consider. 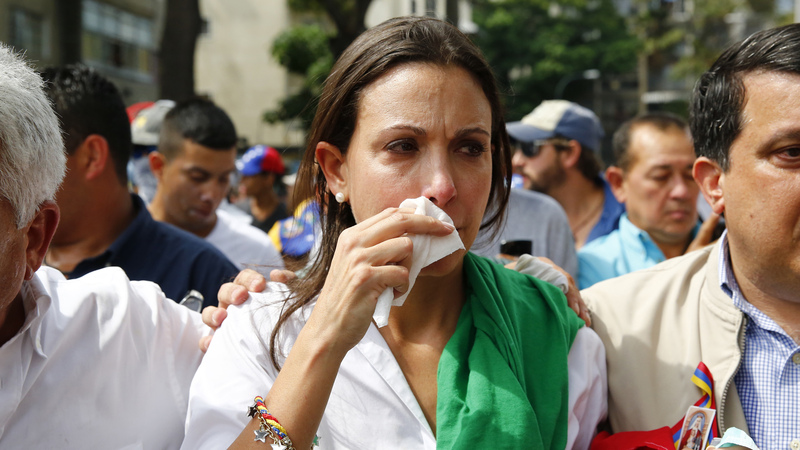 Since 2010, María Corina Machado has been accused of ordering buses burned. Of instigating lawlessness. Of seeking to generate chaos and panic. Of infiltrating provocateurs into queues for scarce basic goods. Of palling around with Lorent Saleh. Of killing six guards. Of killing Robert Serra. Of plotting to kill the president, (on the basis of forged evidence). Of paying a hacker to delete the evidence against her. Of “plotting a silent coup.” Of “seeking a civil war.” Of conspiracy. Of murder. Of terrorism. Of treason. She’s had her followers’ motorbikes burned in Sabaneta de Barinas. She’s had bottles thrown at her in a military parade in Los Próceres. She’s had her face kicked in on the floor of the National Assembly. She’s been threatened with war. She’s been threatened with the death penalty. In a country that doesn’t even have the death penalty. For five years the government has pursued a sustained, cowardly, vicious, illegal, outrageous campaign of vilification and dehumanization against María Corina Machado. You don’t have to agree with her politics to understand no one is safe in a country where people can be brutalized this way.